Just about 100 visitors came to Foxfire to view the eclipse. During my 20-minute presentation on “Folklore of the Eclipse” I posed the question, “What folklore will come of this event?” The question was prompted by the phenomenon of “flashbulb memory”, which is the term psychologists use to describe the way big events (think, JFK assassination, the explosion of the Challenger, 9/11) become seared into our memory. My thinking was that the eclipse will be such an event and I wanted set the stage with our visitors for what was to come. I had never experienced a total solar eclipse. I remember something of a partial eclipse around 1984 (I think), but nothing like what the prognosticators and eclipse enthusiasts were describing leading up to August 21, 2017. From my perspective as the executive director of a museum and heritage center, what I really noticed was that there were predictions of tens of thousands of people coming to the area and I wanted to be sure a small percentage of those folks spent their time with us. So, we created a small event, put up 100 tickets for sale, and sold out in two weeks. We invited those who got tickets to pack up their coolers, come early, and spend the day with us. At totality, night was upon us, and then morning. And come early, they did. When I pulled in at 8:00 am (after navigating around the main traffic by taking Germany Road), there was one car waiting at the gate. Once in the parking lot, I saw that others had managed to come in behind the earlier-arriving staff. From then on, it was a steady stream and we had everyone, for the most part, parked and settled by 11 am. Some came to my talk on eclipse folklore, which I performed five times over about two hour period, most all spent time exploring the museum. We put up signs throughout the museum indicating ideal viewing sites, so folks were scattered all over The Land in little communities of six or 10, picnicking on blankets, reclining in camping chairs, keeping cool in the shade. By 1:15 pm, the first sliver of the moon appeared over the bright orb that was the sun. 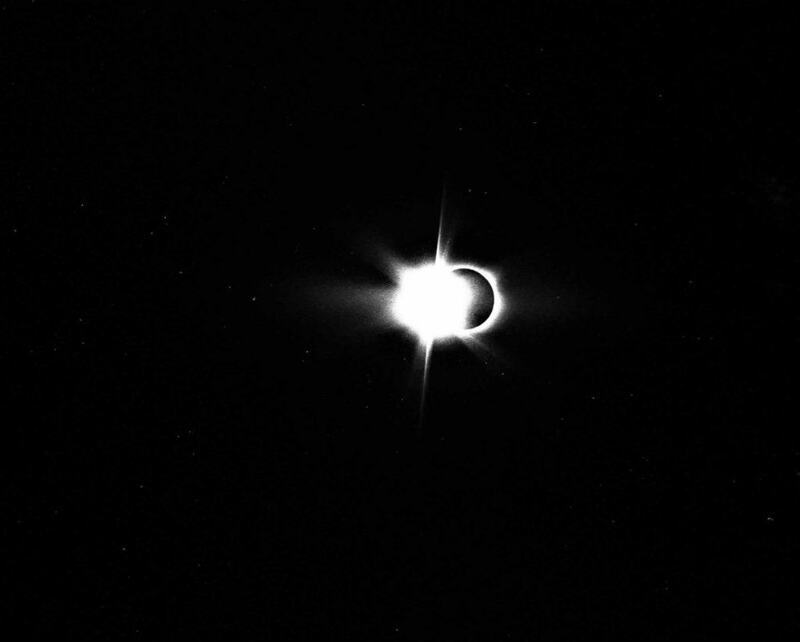 The “diamond ring” effect as captured by curator Barry Stiles with one of his film cameras (yes, they still make film). After that point, folks got focused. We supplied everyone with NASA-vetted and approved solar viewing glasses (thanks to Teka Earnhardt at Explore Rabun), so everyone was able to view the moon’s progress at their leisure. For the next hour, we watched as the new moon, the invisible agent of this event, crept steadily closer to totality. Then, the clouds came. 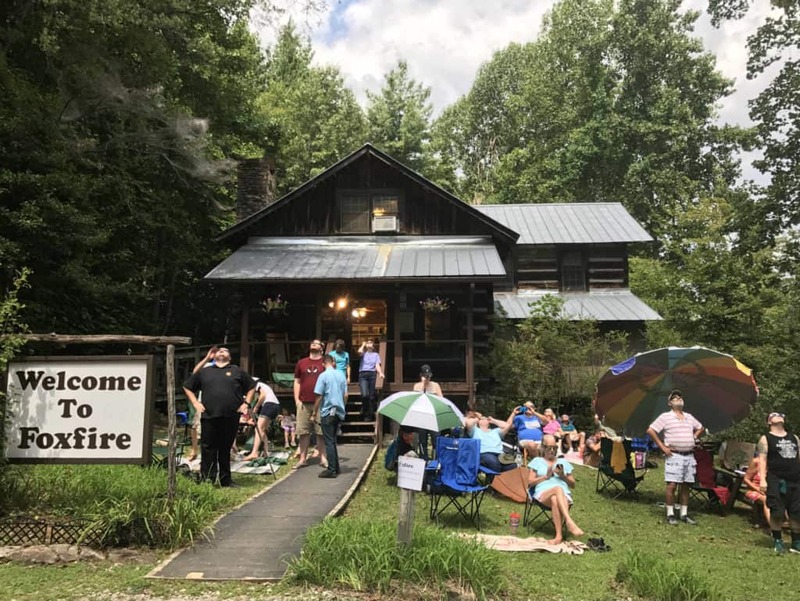 I have to admit, I was a bit concerned – not just for Foxfire and our patrons here, but for ALL those thousands who drove to Rabun County to witness this once-in-a-lifetime event. Behind me, to the east, the sky was thick with clouds. On my weather app, I could see a shower had popped up out around Kelly’s Creek Road. This would not do. Standing in front of the Museum Store, most everyone of us was speaking to the clouds, urging them on and away, begging favors of them to just part a bit so that we could see. At about two minutes to totality, they did just that and we all put on our glasses and watched, in near silence as first, the last flash of the “diamond ring” came, and then darkness fell. Another image captured by Barry Stiles, showing the eclipse at totality and the corona of the sun. I wasn’t ready for it – I don’t know that any of us were. There were shouts of joy, tears of awe, expressions of amazement, people howling like wolves, dancing about, families hugging and laughing, old folks giggling and shaking like children on Christmas morning. I didn’t know what to do with myself. For two minutes and 34 seconds we were all – all of us there in front of the store, and out by the Beck Barn, and up by the blacksmith shop – we were all humbled and amazed and completely stripped of our egos. It was incredible. And then, after what seemed like hours, the first light of dawn shown at 2:38 pm. Shadows spelling out “sun” on an oak leaf hydrangea leaf. We were all blown away. We watched the events of the last two minutes leading up to the totality, rewind and go the other way. Waves of light danced, crescent shadows reappeared. In a funny moment, Beth Zarbanos exclaimed, “Look, it spells out SUN!”, pointing at a leaf near the ADA ramp. Sure enough, it did. She was laughing like a child. We all were. Then, I thought, “and that will be forever canon for some of us – that will be a story we tell about the eclipse … about how the sun spelled out its own name in the shadows.” Just like that, folklore comes to be. So, I have to ask, what stories did you write the day it just went dark? How will you and yours remember the day America stood still together and watched our star get blinked out by the moon? Thank you to everyone at the Foxfire who helped make this such an incredible experience. There could not have been a better place to be for the eclipse. 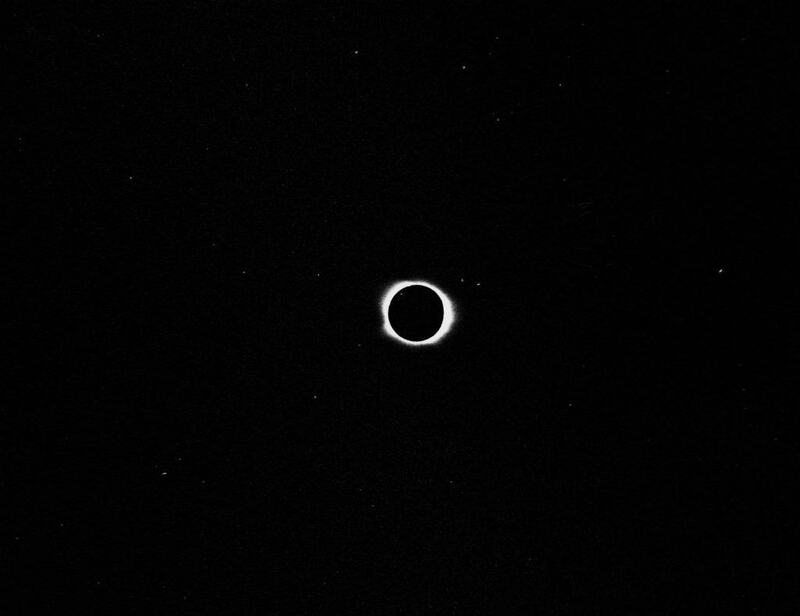 I do not think any of us there were prepared for the stunning beauty that was in store during totality. It was simply the most beautiful phenomenon I have seen. We were all awestruck by the sight. Then another amazing phenomenon happened. The two minutes and thirty seconds of totality bonded a group of strangers into what seemed like family. It was a humbling and unifying that our family will never forget. I had heard people say that witnessing a total eclipse is a spiritual event that changes you. After witnessing one I have to agree. 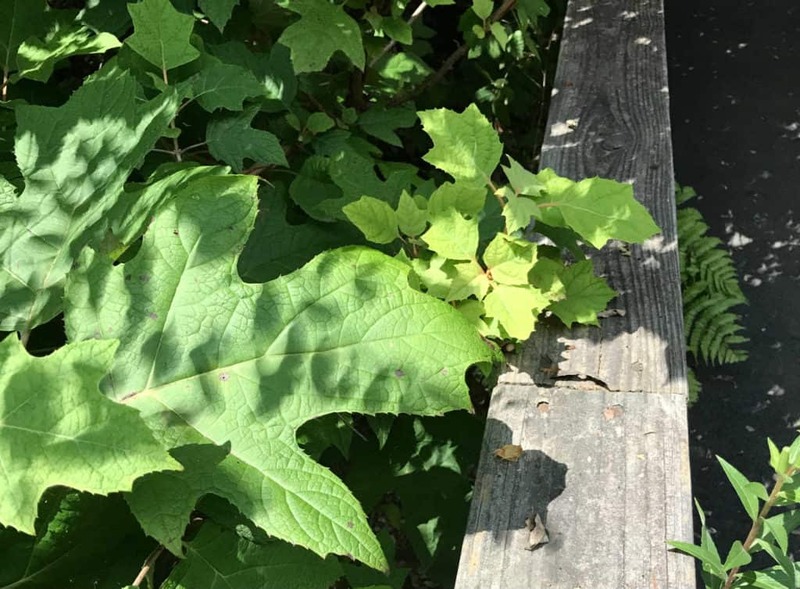 The eclipse and the Foxfire are now a significant part of my life story and I am inspired to go more places, learn more, and experience more of the natural beauty around us. Thank you again to all the staff for putting this together. A beautiful description of a transformational experience. Foxfire’s ability to enchant with the natural world now reaches to the stars! What a wonderful event that must have been on the Mountain. 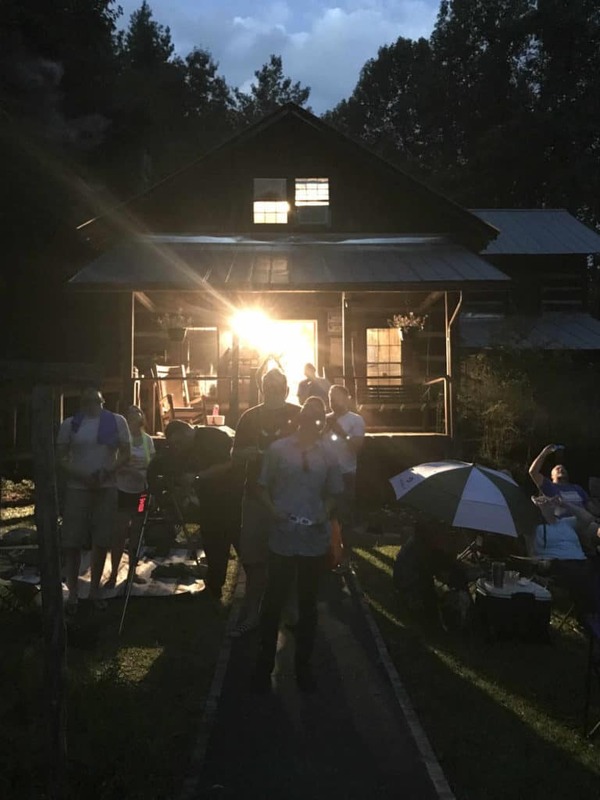 Perhaps the Foxfire Magazine Class will want to write an article or even dedicate an issue to this phenomenon–the stirred emotions of those at Foxfire that day, Foxfire contacts’ memories of other Southern Appalachian eclipses in their past, and the folklore of eclipses TJ spoke about that day.